Thank you for buying our theme! Thank you for buying our theme Vomoda! Please use this guide to setup your theme and configure it's settings. We'll do our very best to reply as soon as possible! In order to proceed with the theme installation, you need to make sure you have the latest version of WordPress (3.5+) on your self-hosted site. Log into your WP Admin and browse for Appearance → Themes. Now navigate to the secondary tab: Install Themes and click the Upload link option. Follow the instructions by choosing the file "vomoda.zip", located in the archive which you have downloaded from the store and click "Install Now" button. Note: Do not upload the entire zip file you received after purchase, unzip the "do-not-upload.zip" file first. Within the unzipped folder you'll find another folder with the same theme name (vomoda.zip). THIS is the zip file you will need to upload to WordPress. Click Activate link, once the upload has finished, and you are ready for the next steps. Click on install the required plugins. Install Plugins - On the new page you can select both plugins. Select Install under the Bulk Actions list and click apply. Activate plugins - After you installed the required plugins you need to activate them. Again, select both plugins, select Activate under the Bulk Actions list and click apply. That's it! Navigate to Tools → Import. Click on "WordPress" link (if the Importer plugin is not installed, install it now). Select the demo-content.xml file located in the files you have downloaded after purchase and click the "Upload file and import" button. The next page will gives you an option to import the author. Make sure to click: "Download and import file attachments" if you want to add the demo images! Please be patient while WordPress is importing the content, this can take a few minutes. Your are done! Now your site is populated with demo content. Both menu's support 2 levels of drop-downs. If you imported our demo content, you will find a premade menu named "primary menu"! Go directly to Appearance → Menus → Manage locations and assign this menu to the primary menu location. Navigate to Appearance → Menus and click Add Menu. Give it a name, add links and click "Save Menu" button. Click on Manage Locations tab (WP 3.6), assign a Menu Location for your newly created menu. Vomoda comes with a clean and elegant homepage and is packed with options to style it. If you would like to adjust the amount of posts shown per page you can go to Settings > Reading > Blog pages show at most and change the number. In our demo website we use 3 posts per page. Optional: To disable the admin bar when you are viewing the website while logged in go to: Users → Your Profile and disable "Show Toolbar when viewing site". 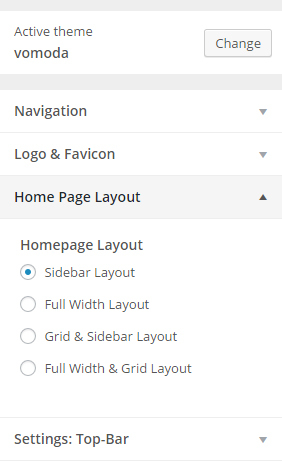 To change your homepage layout go to: Appearance → Customize → Homepage Layout and for example change the Homepage layout into a Sidebar & Grid Layout. In our demo website we use this layout but feel free to try out your own new combinations! To create widgets like our demo website navigate to Appearance → Widgets. About Widget Displays an "About Me" widget. You can add an image and description. Recent Posts Shows your latest posts from all categories or a specific category. Width and Height (Tip: 238x253). Social Icons This widget will display social media icons of your choosing. Just fill in the full URL's of the social networks you want to display. Flickr Stream This widget will your latest Flickr Photo's. Just fill in your Flickr ID and use the options to customize your layout. 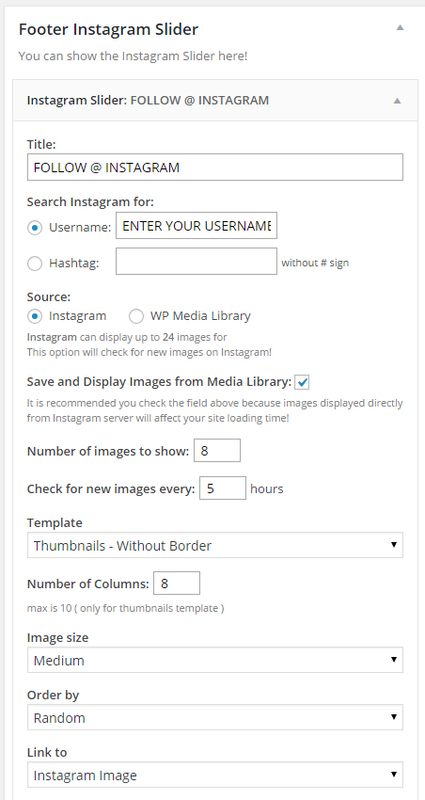 Instagram Slider Ensure the Instagram Slider plugin is activated. This will display your latest Instagram images. To create the featured slider like our demo website, navigate to Appearance → Customize. On this page you will see our Live Customizer! On the left side of the screen, click on featured area settings. This is how our setup looks like! Click SAVE and your slider is finished! To create a new post navigate to Posts → Add New. You can edit the look of your post by going to Appearance > Customize > Settings: Post and Page and hide/show different elements on the post and page. Helen Supports 3 post types; Standard, Gallery and Video. You can switch between these formats in the post editor. A standard post format will look like a usual WordPress post. A Gallery format will show a slider with your selected images on the home and post page, you can add these images to the slider with a simple click interface. A Video format will show a video instead of an image. Just paste the url of a Youtube or Vimeo video into the box below: "VIDEO URL (EMBED) OR EMBED CODE". You can go to Appearance → Customize → Settings: Post and Page and hide/show share buttons or the post category. To create a Contact page, we use the plugin "Contact Form 7" and we have made it easy for you to use this plugin. After you imported the demo content you can check out a demo on the premade contact page. Vomoda uses the WordPress Post Thumbnails function. These are the images for your posts/pages and are shown on different positions in different sizes. 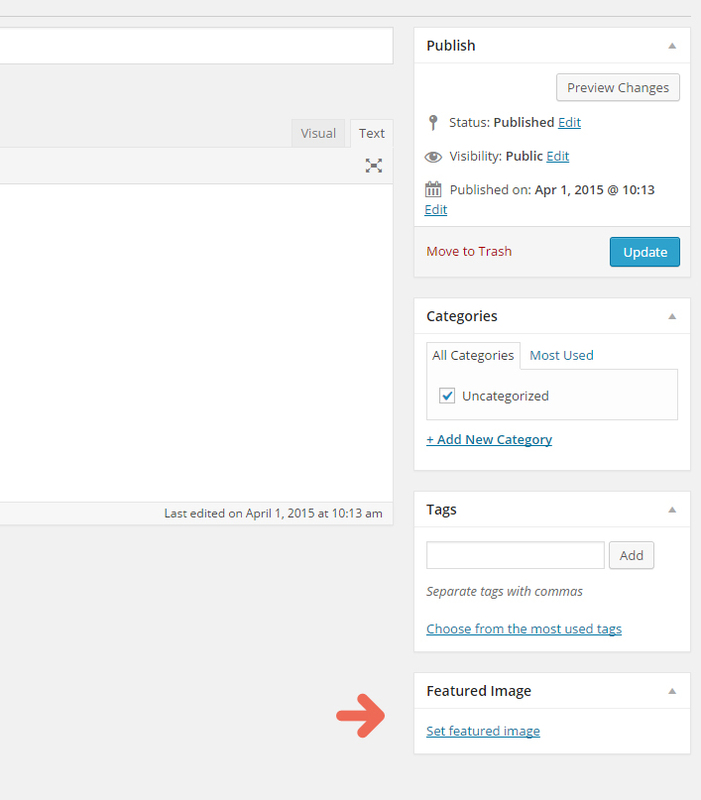 WordPress will automatically resize your images to all of these various sizes used. You should always use images for posts with at least 1080px width to funtion correctly on your website. The normal upload box will now appear. Upload your image and click "Use as featured image". Now simply close the box. Each section features options so that you can easily customize the theme to your needs! There are two ways to customize the theme without changing it's core files. It's important not to touch the theme core files because every time we will update the theme, you will lose you changes. To style the theme with custom CSS, navigate to Appearance → Customize and click on the "Styling: Custom CSS" tab. This is where you can write your own CSS code. Now locate the vomoda-child.zip inside the "Theme Files" folder which you have downloaded after your purchase and double click on that file. That is it, now the child theme is ready. You can open the style.css file and write your CSS there. It will override the default the CSS from the parent theme. You can also copy any file from the parent theme, put it inside the child them and make the changes.